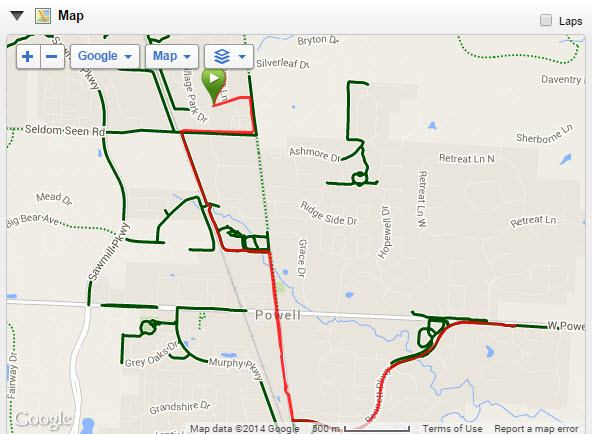 After about a mile or two, I felt pretty good and Tobey was doing great so I set a goal of 4 miles…. however, when we got to the turnaround point. The plan was to run to the Powell Library and turn around…. however, when we got there we just kept going. The way the pups were running, they didn’t want to stop. We were all doing great until the final 1/3 of a mile. Tobey scraped his paw, but he plowed on. In the end, we went 7.02 miles! A new personal record for Lillian and a huge accomplishment for Tobey (just 2 or 3 weeks ago, he was limping and I was worried he may never run again). After the run, I can’t help but smile with a great sense of accomplishment and an hour spent with my two best friends. Update: After checking, this is my longest run since I ran the same distance on November 25, 2012 and I haven’t run a distance longer since May 7, 2011 when I ran the half marathon. The dogs have struck again. I have two new brands of spackle I’m going to try. One from the Home Depot and one from Amazon. I may also be applying bitter apple before and after I paint. Oy. 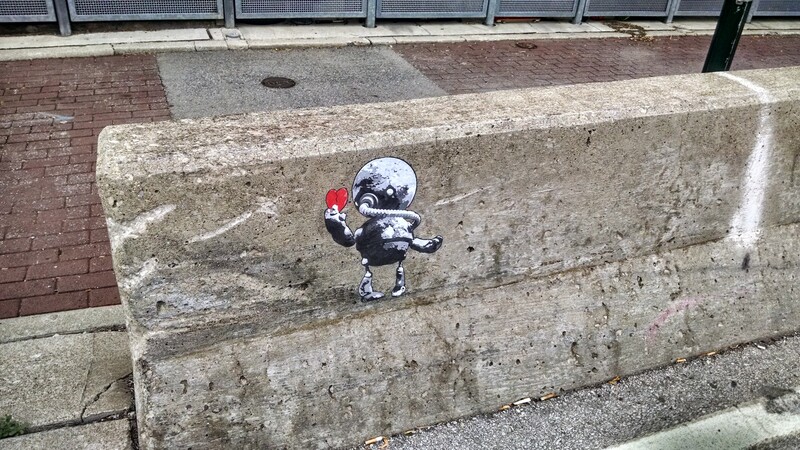 Found these in Columbus, OH. The top picture is at 3rd and Chestnut and the bottom picture is in the Pearl Street ally. 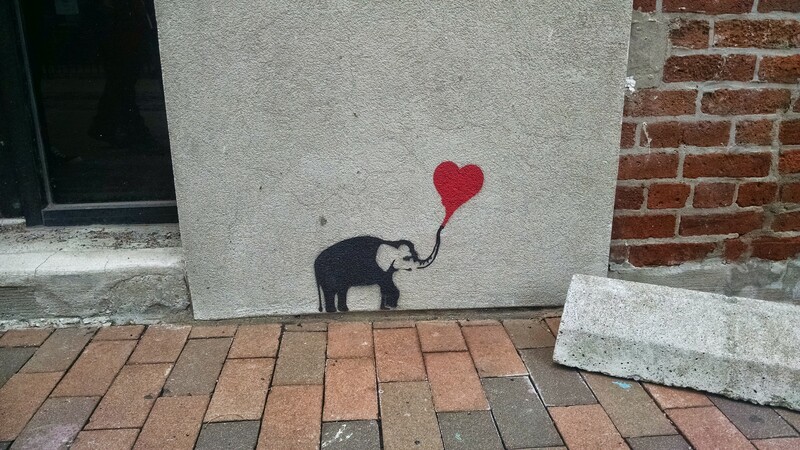 Love the hearts. The top one is a sticker and the bottom one is painted. One of the things I like about home ownership is making improvements. Since I’ve owned my house, I’ve tiled bathrooms, replaced fireplaces and updated fixtures. 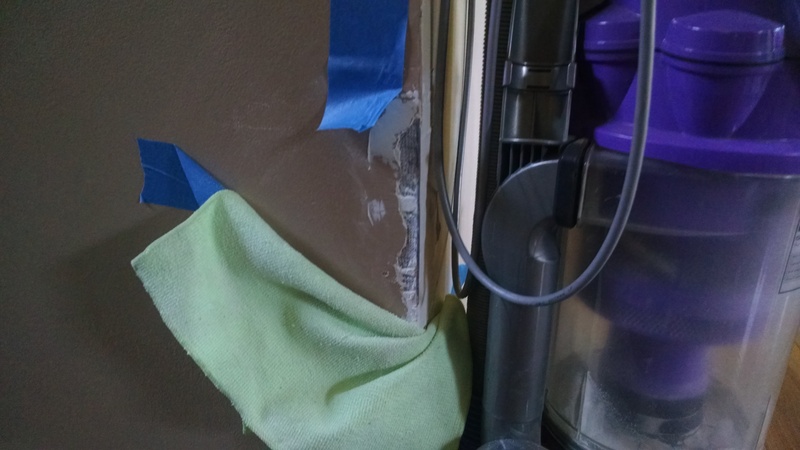 Most recently, I was fixing some blemishes in the kitchen by spackling one of the walls…. Unfortunately, the pups took an immense interest in the project. I don’t know what it is, but Tobey (the gray weimaraner) loves the taste of dried spackle… and Lillian (the blue weimaraner) loves the taste of drying spackle…. which made a simple project, turn nearly impossible. Below is a timeline in pictures of the never-ending project…. 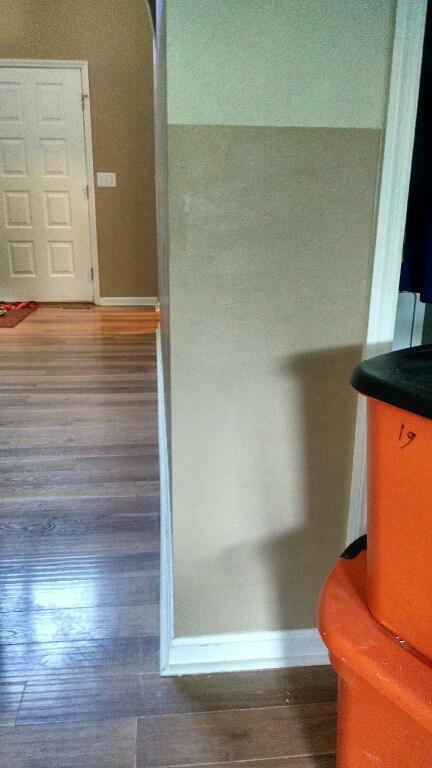 The first photo is the day of the first spackling. The dogs made the hole probably 3-4 times bigger than the original part I was fixing. No big deal I thought…. 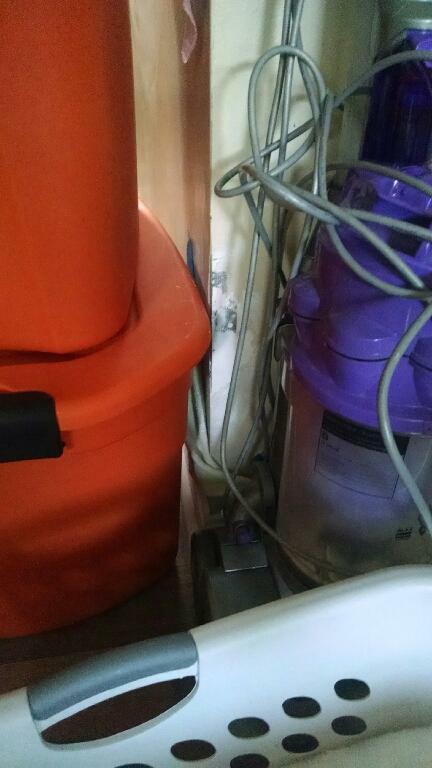 I’ll patch it and put a rag over it while it dries and block it with the vacuum so the pups can’t get to it…. that has to work….. 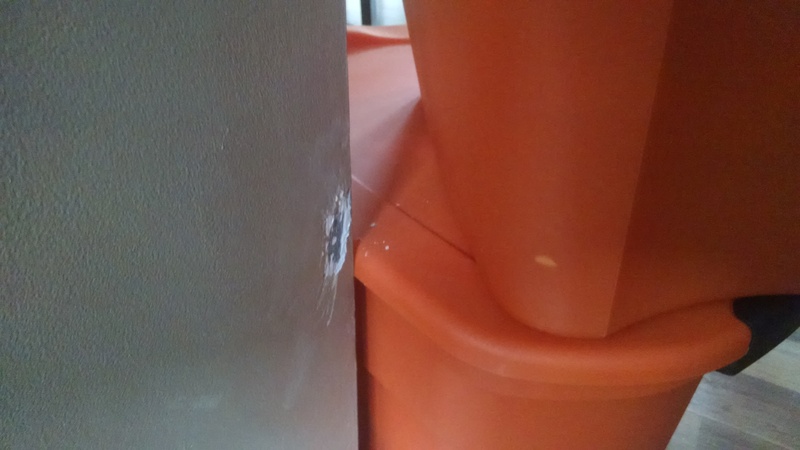 The next thought was to patch the wall and barricade the entire corner off so there is no access…. The below picture showed how well that worked…. Somehow, the pups climbed on top of the barricade…. oy. Eventually, the weekend came where the dogs would be supervised the entire weekend. 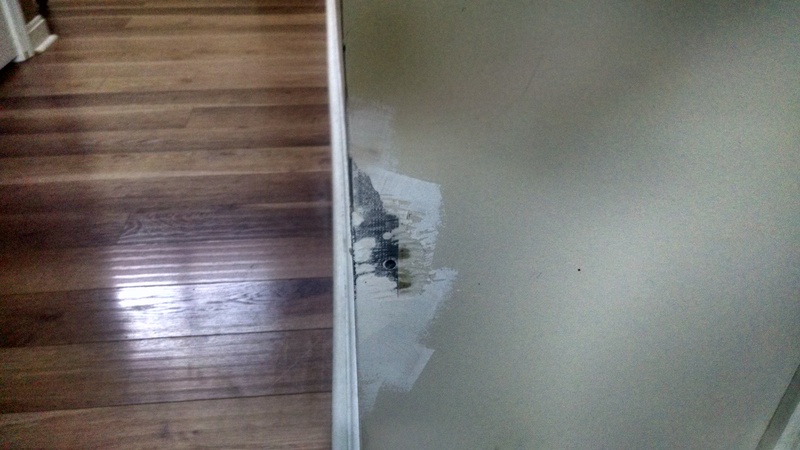 I finally was able to to patch it properly and put two coats of paint on the wall…. which led to…. 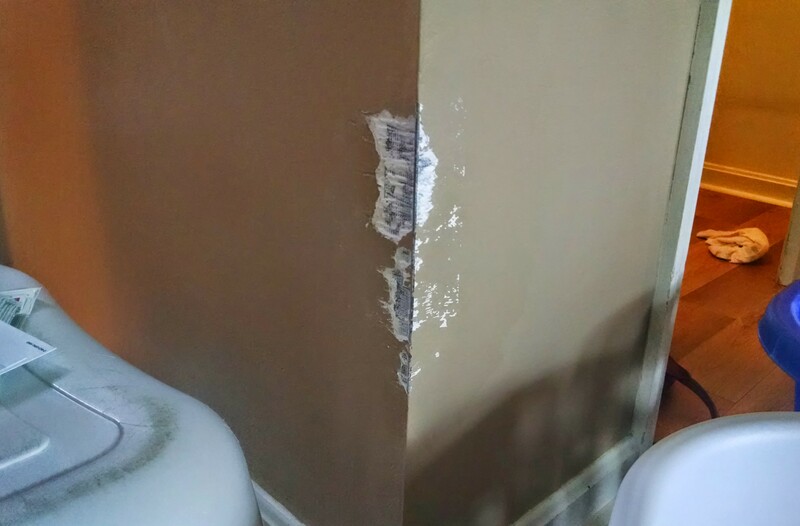 In all, the dogs have eaten the wall at least 5-6 times. I now have a rush order of bitter apple spray on order from Amazon…. hopefully… that’ll stop the madness…. In the meantime, the inmates continue to run the asylum. If you’ve ever had experience with dogs eating things or want to laugh at my misfortune… feel free to drop a note below.